The Gordon Movie Theater is getting one final push on its way to re-opening thanks to Open Range Beef. The Gordon packing plant is donating 2,500 pounds of their organic, grass-fed beef to be sold on a first come, first served basis Saturday, April 22 from 11 a.m. to 3 p.m. in front of the old Ideal Market building at the intersections of highways 20 and 27 in Gordon. Open Range Beef is no stranger to giving back to the Gordon community they are proud to call home. They were instrumental in securing a new CT Scanner for Gordon Memorial Hospital, donating a truckload of meat and countless hours of labor to the cause. Nearly every benefit auction held since the plant’s opening has also featured donated boxes of their specialty meats. This offering will include approximately 625 lbs. each of ribeyes, tenderloins, strip loins and top sirloins. The meat will be sold frozen whole, with each piece weighing approximately 10-12 lbs. In order to expedite the process, all pieces will be sold at a flat rate based on average weight with ribeyes selling for $84 ($7/lb. ), tenderloins $96 ($8/lb. ), and strips and top sirloins $60 ($6/lb.). Fresh samples will be available hot off the grill for patrons to try. ORB employees will also be grilling burgers, which will be sold for $5/plate, to include chips and a drink. “Open Range Beef has had a customized BBQ grill fabricated for events like this – a Man-grill,” said Todd Arends. “Even more impressive are the burgers coming off the grill by ORB’s finest BBQ masters. Every person buying a burger is personally participating in bringing back the Gordon Movie Theater”. All of the proceeds from the sale will go toward the renovation and re-opening of the Gordon Movie Theater. The theater recently reached their initial goal of $208,000, which was the minimum needed to complete all construction necessary to get the doors open and purchase the necessary equipment. This additional funding will go toward purchasing additional equipment, seating upgrades for increased longevity and an improved viewer experience, as well as purchasing a new marquee for the front of the theater. The funds will also allow the theater to start with additional savings to account for future repairs and expenses. Can you believe we've already raised over $170,000!? Less than $40,000 to go!! Help us raise the rest by attending our Open Season steak dinner and auction, Saturday, Nov. 12 at 6 p.m.! Help us fill the theater with seats! Don't miss your chance to be part of the theater renovation! 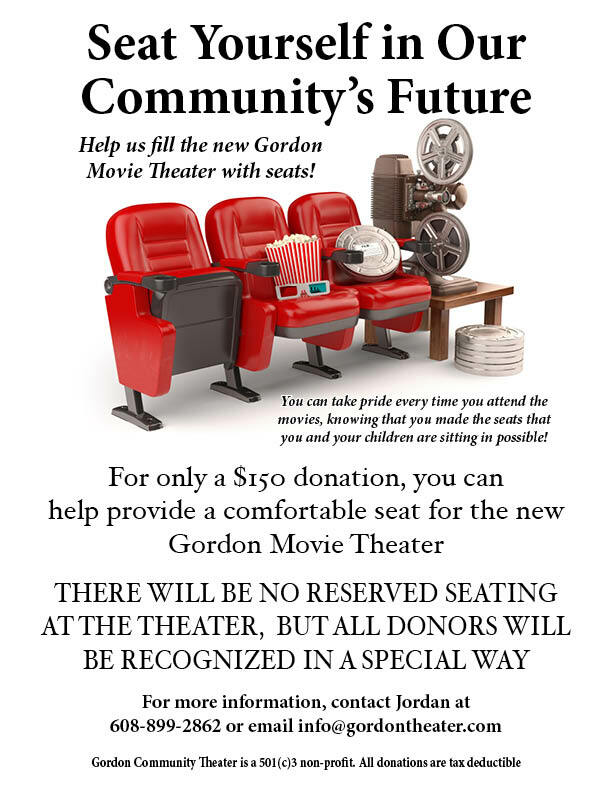 For only $150, you can provide one seat for the new Gordon Movie Theater! It’s almost show time for the Gordon Movie Theater after receiving a $50,000 challenge grant from the Peter Kiewit Foundation. The challenge grant states that matching funds in the amount of $58,224 must be raised by March 31, 2017 for the funds to be released. The grant puts the theater’s fundraising total just shy of $150,000. Gordon Community Theater will be hosting a Daddy-Daughter Dance Saturday, April 16, 2016, from 7-10 p.m. at the Gordon City Auditorium. The cost is $25 per daddy-daughter(s) group. All funds raised will go toward the renovation and re-opening of the Gordon Movie Theater. There will be a live DJ, professional photographer, hors d'ouerves and refreshments. A planning meeting is being held Thursday, March 24, at 6 p.m. at the Gordon City Auditorium. Anyone interested in helping with the event are encouraged to attend. Pre-order tickets are now available at the Sheridan County Journal Star, The Coffee Nook, and Stockmen's Drug. The effort to renovate the Gordon movie theater took another step forward last week when a new rubber roof was installed on the theater building by Twin City Roofing of Scottsbluff. The old roof had developed a few leaks and, after receiving several bids and recommendations, it was decided by the theater board that a new roof would need to be installed as soon as possible to prevent damage to the inside of the building. “Whether or not the theater project goes through - and I fully believe it will - that roof was going to need replaced if anyone is ever going to use that building for anything again,” said president Jordan Huether. The roof was done using funds from the Ukena Charitable Trust and the Turner Foundation and comes with a 15 year warranty. The board will continue fundraising and grant-writing until sufficient funds are raised to proceed with the rest of the renovation. To date, the theater project has raised $87,000 for the project, with another $113,000 needed before the project is completed. If you would like to donate to the project, checks can be sent in care of the Gordon Community Theater to Bank of the West, 205 N Main, Gordon, NE 69343. Are You Ready for a Movie Theater? 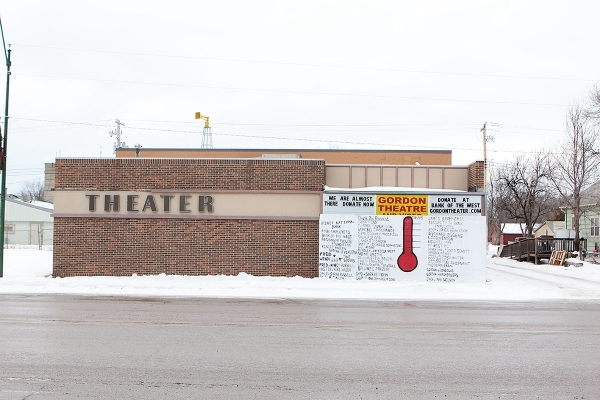 The Gordon Community Theater is now a 501(c)3! Big things are in the works to get our movie theater back up and running! We have assembled a board of dedicated community members and are still looking for a few more motivated individuals to join our ranks. A budget has been established, and we have a plan to bring you one of the best theaters in the region. The new Gordon Theater will feature a stunning 4K digital projector, thundering surround sound, comfortable seating, affordable concessions, and much more! © 2014 Gordon Community Theater, Inc. All rights reserved.